The ability to see far distances has been a valued tool throughout time, from commanders on the battlefield to ship captains. These days outdoorsmen throughout the world appreciate the ability to see a little further. Hunters like the ability to scout their prey, judge who’s the largest or who is perfect for the hunt. Hikers like the ability to scout a route and avoid obstacles as much as possible. And bird watcher, naturalists, and anyone who enjoys a close up view of nature will appreciate the ability to see. Binoculars, of course, draw their name from 2 lenses. A good set of binos utilizes both eyes to look through a dual set of lenses to observe and scout. Binoculars are much more common than monoculars and are easier to find at any price range, size, and variation. 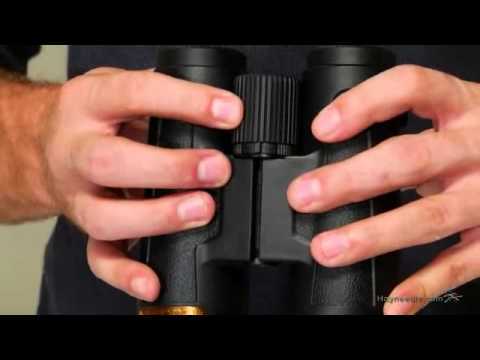 Binoculars are made by every major optics company in the world, and range from some truly fantastic optics to some very cheap, very poorly made set. Binoculars are used by all kinds of outdoorsmen and can be found widely in the military. A single-lens device that makes it incredibly easy to see at extreme distances. These devices are small, light, and compact. They are a natural evolution of the old school telescope and fit many of the same roles. 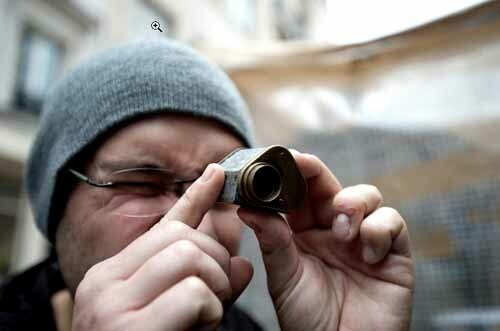 Monoculars are varied in size, power, and price range, but are not as common as binoculars. Night vision monoculars are the choice of most modern military forces. The monocular isn’t quite a specialty item but is chosen by those with a specific preference for it. Binoculars like the BX-2 Acadia models are designed and built by the same Leupold that produces some of the best rifle scopes out there. The BX-2 Acadia binoculars are built to run and run hard. Leupold is a no-nonsense manufacturer of some of the best optics out there. This fixed power optic gives users an 8 power magnification with a large 42 mm objective lens gives you a clear image with a wide field of view. With the medium magnification, your eyes are unlikely to get tired very fast and one could observe at their leisure. 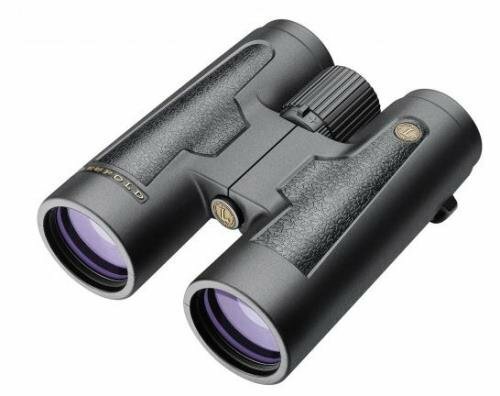 The 8x Acadia binoculars (see full specs) are waterproof, fog proof, and field ready! The design incorporates a large, tactile focus dial that’s easy to use with the wettest of hands, or when they are half frozen. The phase coated roof prisms offer increased resolution and a crystal clear picture. This is just one type of binoculars, and there are tons of other options out there. For example, we have the Nikon Aculoan binoculars. 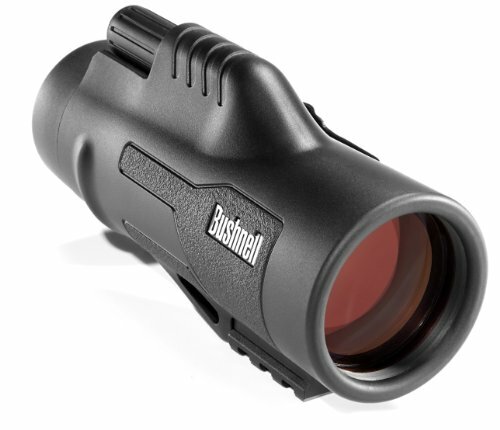 These binos are a variable model that pack a lot of power into a compact and capable package. 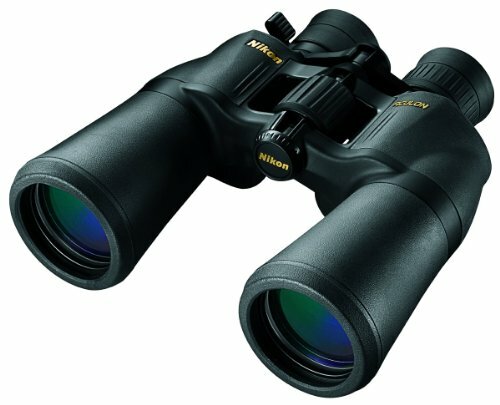 The Nikon Aculon series of binoculars give you 10 to 22 power magnification level with a 50mm objective lens. The Nikon Aculon series is extremely powerful and well made. Nikon knows what’s what when it comes to optics. They make a wide variety of different models of riflescopes, binoculars, spotting scopes, and more. They cover the entire gamut of optics. The Aculon series is coated with a durable rubber armor coating that provides a non-slip grip for use in all conditions. The Nikon Aculon is a brilliant set of bincoulars that really shows you how far you can reach out and see a target. 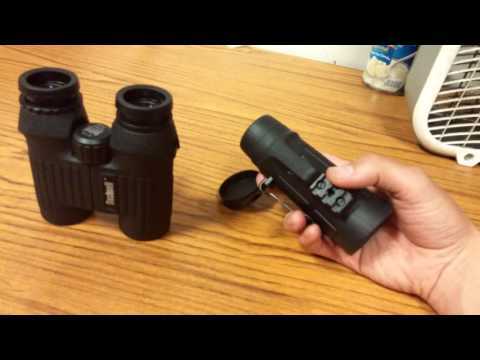 These sets of binoculars are good examples of some of the disadvantages of binoculars, though. Binoculars are larger, heavier, and can never be as compact as monoculars. Binoculars also take up a lot of space in a pack, and unless they are relatively small and low powered, they are hard to carry in a pocket. One of the main reasons tripods are popular with binoculars is their weight, which can tire arms over a long period of time. Monoculars like the Bushnell Legend Ultra HD provide an absolutely fantastic view when looking through them. The Ultra HD provides users with a 10 power magnification and has a 42mm objective lens. The design is built to last for decades of heavy use, and boasts some awesome features. The monocular (see full specs) is waterproof, shockproof, and fog proof. It’s designed for heavy field use, and is fantastic at it. Another excellent, budget-priced monocular is the Orion model; it’s a variable optic with the ability to swap between magnification levels of 10 and up to 25 power. This is a fully waterproof monocular that boasts the ability to be tripod mounted. 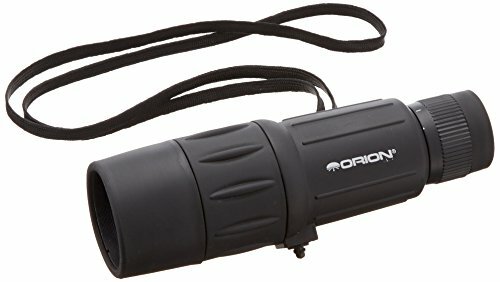 The Orion shows the monocular ability to be light and small, at under 7 inches long, and weighing only 12 ounces. However, when thrown up to 25 power of the Orion or the 10 power of the Bushnell, you meet the main disadvantage of a monocular. It might uncomfortable to look through over long periods of time. The 42mm objective lenses are sufficient for light gathering, but since you are only using one eye, you lose a ton space in your field of view. To answer this question, I have to ask what are you doing with it? What is your task or hobby where you need something magnified? If you are a hiker, or explorer, I’d suggest the monocular. The hiker typically scouts swiftly and is often moving, making the smaller, lighter monocular more beneficial. The hunter, on the other hand, is often tasked with scouting and watching areas over long periods of time, and they are also often in a stationary position, making binocular weight a non-issue. There are outliers on each side of course: a hiker who’s also a bird watcher would be better suited with binoculars and a hunter who hunts birds is better suited with a monocular. Whatever the case, always buy your gear to work with your objectives, and to work with the task at hand. There is rarely a universal answer so don’t expect one. Like always try to buy the highest quality possible when shopping for optics. High quality means increased clarity, and the whole point of optics is too see through them clearly. Good luck! I can only focus out of one eye at a time, so I’ve gone for the monocular.